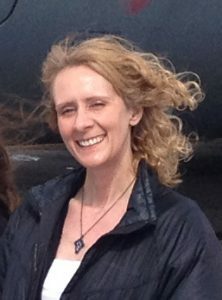 Dear Readers: One of the high points in my life this year at Oshkosh, was meeting Jen Adams, an aviation enthusiast I’ve come to know rather well. She’s not a pilot, but rather a person who found gainful employment at an airport and realized she was and continues to be fascinated by what she found there. This is her first story for Jetwhine. Both Scott and I hope you enjoy it as much as we did. As a female aviation enthusiast, I want to do my part to encourage a passion for aviation in the next generation, especially girls. 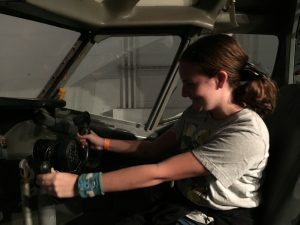 To that end, I’ve taken my teenage daughter and her friends on several aviation-related excursions to museums, airports and even an air show. While they always managed to have fun, their interest in aviation remained decidedly lukewarm. I’ll admit I was a bit disappointed – I was hoping for a little more enthusiasm. But I consoled myself with the knowledge that at least I had tried. Then one day my daughter overheard me talking about a friend who had gone on a biplane ride the previous weekend. Her response surprised me: “Awww – that sounds so cool!” Wait… what did she just say? So I asked, “Would you be interested in doing a Young Eagles flight to learn more about being a pilot?” Her response was an immediate and emphatic “Yes!” No maybes or requests to think about it. No hesitation at all. I was both elated and a bit dumbfounded. So she IS interested in aviation! But… I didn’t think she was. How could I have been so wrong? My first mistake was expecting my daughter to like aviation the same way I do. I can sit around and watch airplanes all day. She can’t. She’s not much of a watcher – she’s more of a doer. I should have realized this, but I didn’t. My second mistake is almost embarrassing to admit because it involves stereotypes. My daughter is an artist and an actress, a dreamer who likes to write short stories. Somehow I allowed myself to believe that these qualities are incompatible with an interest in flying. This is completely wrong and I know it. I have several friends who are commercial pilots who are also involved in the arts. How on earth did I make this mistake with my daughter? Is it because she’s a girl? I’m sad to say… possibly. My third mistake was expecting my daughter to say something. I figured that if she wanted to try flying she would tell me. But then again she IS a teenager and they aren’t always very communicative, especially with their parents. Before I beat myself up too much I should point out that I did do at least one thing right: I didn’t give up. In the end I was able to toss aside what I thought I knew about my daughter’s level of interest and simply ask the question: Would you like to fly? It makes me wonder – how many other girls would say yes if only someone would think to ask? Jennifer Adams blends her passion for aviation with her profession of accounting by working for a medium-sized airport in the Midwest. When she isn’t calculating landing fees, she’s keeping an eye on the airplanes outside the window and blogging about her adventures at talesfromtheterminal.com. Airlines, Lost Bags and Customer Service … Oh My! This entry was posted on Monday, December 12th, 2016 at 3:19 pm	and is filed under The Buzz. You can follow any responses to this entry through the RSS 2.0 feed. Both comments and pings are currently closed.